Zambian court upholds opposition leader treason charge – Royal Times of Nigeria. Zambia’s main opposition leader Hakainde Hichilema’s plea to drop treason charges against him by the government has suffered a setback as a court today refused a request after he allegedly blocked the president’s motorcade earlier this month. Hichilema was arrested two weeks ago for allegedly obstructing President Edgar Lungu’s official limousine as both men travelled to a traditional event in Zambia’s Western province. He is accused of endangering Lungu’s life when Hichilema’s own convoy allegedly refused to give way to the presidential motorcade in the high-speed incident on a main road on Saturday April 8. Hichilema’s lawyers had asked the court to throw out the treason charges. But magistrate Greenwell Malumani ruled that he did not have the power to dismiss treason charges which can only be handled by the High Court. “The law does not place power in the subordinate court to quash the indictment. The motion to quash the treason charge is untenable,” he told a packed court in Lusaka. 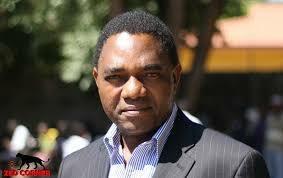 Hichilema, 54, a wealthy self-made businessman, has been in custody since police raided his Lusaka home on April 11. He made a fifth bid for the Zambian presidency last year and has sought to challenge the legality of the most recent election which he narrowly lost to Lungu. That campaign was marked by clashes between supporters of Lungu’s Patriotic Front (PF) party and Hichilema’s UPND.